The Special Collections & Archives are happy to announce that the Fred E. Weisgal Papers are now open for research! The Fred E. Weisgal papers are a new archival collection in the Special Collections and Archives! Fred E. Weisgal (b. 1919 – d. 1991) was a prominent civil rights attorney in Baltimore during the twentieth-century. If you haven’t heard of his name before, you’ve probably heard of the cases he argued! If you’re interested in constitutional law, attorneys from the Baltimore area, learning about thehistory and life of one Baltimore lawyer and musician, or conducting primary research related to Baltimore history and civil rights, this collection is perfect for you! Born in Czechoslovakia, Fred E. Weisgal moved to the U.S. with his parents as an infant. They settled in Baltimore and Weisgal grew up and spent much of his life here. Weisgal attended Johns Hopkins University and earned law degrees from the University of Baltimore Law School in 1946. He set up his own law office while still in his twenties. 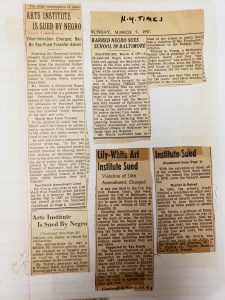 In his first major case after graduation from the University of Baltimore Law School, Weisgal represented an African American Army veteran in his suit to admit African American students to the Maryland Institute art school (now Maryland Institute College of Art) in 1947. Weisgal then began working for the American Civil Liberties Union of Maryland and focused his efforts on criminal law, constitutional law, and civil rights. He often represented clients and causes without pay (pro bono) and was said to be a defender of the underdog. Newspaper clippings, 1947 March 9; Fred E. Weisgal papers, Series 2, Box 2, Folder: Charles Hamilton Houston and Norris. Baltimore Special Collections and Archives. In 1963, Weisgal successfully argued before the Supreme Court of the United States in the case of White vs. Maryland. This landmark case established the principle in the U.S. that a person accused of a crime is entitled to counsel at the first stages of judicial proceedings. Weisgal was involved in many noteworthy cases and causes throughout his career. Many of them began in Baltimore but, had lasting and far-reaching impacts. He represented Madalyn Murray, a well-known atheist, in her suit to outlaw religious observation in Baltimore public schools in 1960. The case later combined with another related case and went to the United States Supreme Court in 1963. Weisgal also represented Reverend Philip Berrigan, a member of the Catonsville Nine and an anti-war activist, when he was accused and convicted of splattering blood on Baltimore draft cards. Throughout his law career, Weisgal was involved in local issues and causes, and he worked to end housing discrimination in Baltimore. In 1969, Weisgal and his family emigrated to Israel. There, Weisgal served as a senior adviser to the attorney general in Israel and then headed the American law section and foreign relations for the Ministry of Justice. While in Israel, Weisgal had some amount of fame as a civil rights lawyer expatriate and was known to play piano at the American Colony Hotel. He retired in 1987 and returned to the United States and Baltimore to live in Roland Park with his wife, Jeanne. Throughout his time in school, his law career in Baltimore, and his career in Israel, Fred Weisgal was a musician. He played jazz piano in Baltimore nightclubs and in other regional venues to support himself while he was in school. Though he didn’t pursue a professional music career, it was an important part of his life. Weisgal wrote music to perform with and for others at events and charities, and he composed a piece for the TV movie A Woman Called Golda in 1982. Weisgal collected art and antiques, wrote articles and short stories, and performed piano throughout his life. Biographical Sketch, undated; Fred E. Weisgal papers, Series 1, Box 1, Folder: Biographical Sketch and Resumes. Baltimore Special Collections and Archives. 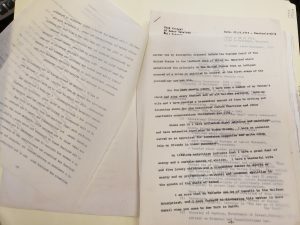 The Fred E. Weisgal papers are an archival collection filled with clippings, case materials, correspondence, and other items that document Weisgal’s legal career in Baltimore, work in Israel, and his artistic activities throughout his life. The collection contains materials related to Civil Rights and the ACLU in Baltimore. 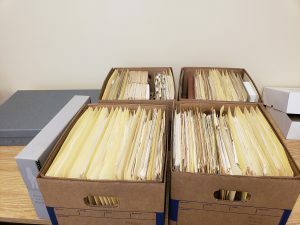 If you would like to view and/or use the Fred E. Weisgal papers for yourself, please contact the Special Collections & Archives to set up an appointment! This entry was posted in archival research, baltimore, Baltimore '68, Baltimore Heritage, civil rights, maryland, social change, social history, Special Collections and tagged Archival Research, Baltimore, Baltimore History, Civil Rights, found in the archive, Fred E. Weisgal Papers, Maryland by Laura Bell. Bookmark the permalink. Thank you so much for doing this! My dad was a great man. Next → Next post: Join Us for #AskAnArchivist Day Oct. 3!